Wow! We were so busy yesterday and it was a zoo around here. To reward those of you waiting ever so patiently for Melt and Pour soap, here it is. Tada! I decided that I would share two soaps with you today to make up for the delay. Melt the Transparent Melt and Pour soap. I usually take about 2 ½ minutes in the microwave for the or 1 pound of soap I’m melting. 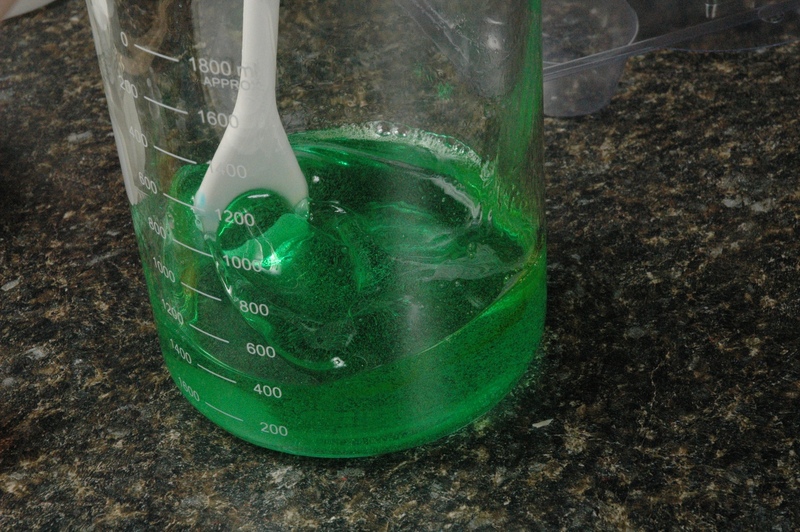 Once the soap is mostly melted, stir the soap to melt the small chunks still in the soap. This is done to prevent the soap from getting too hot and making it so you possibly burn yourself. 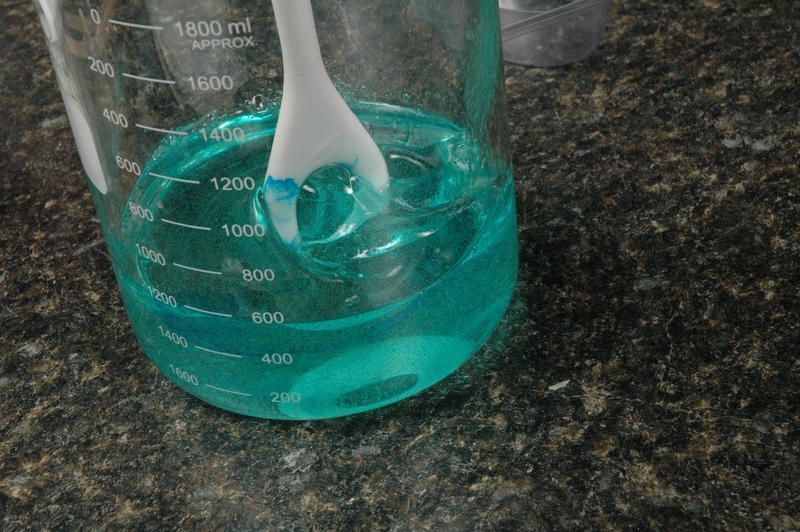 Once the soap is melted, add 3 drops of Blue color and 2 drops of Yellow color. 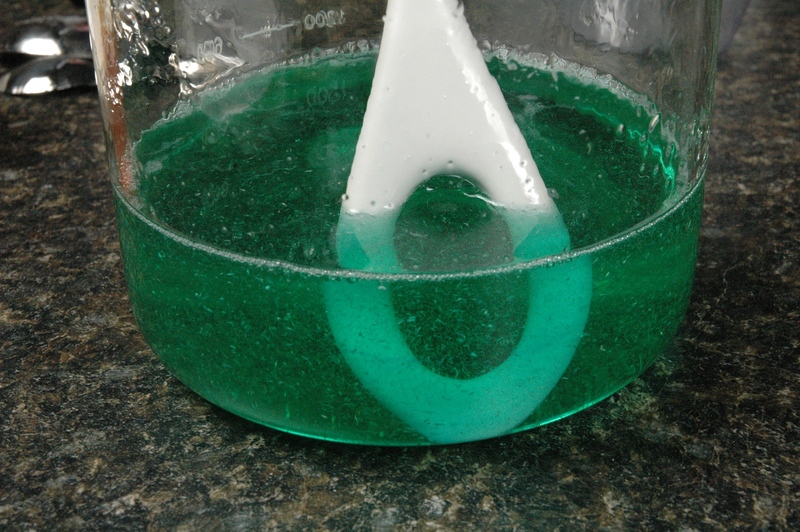 Stir in color and mix until soap is colored. 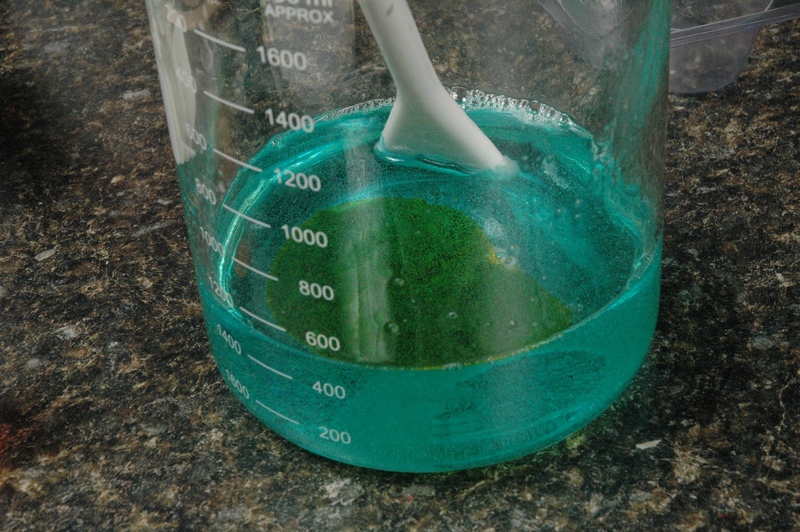 Add 4 mL of Eucalyptus Spearmint Fragrance Oil. 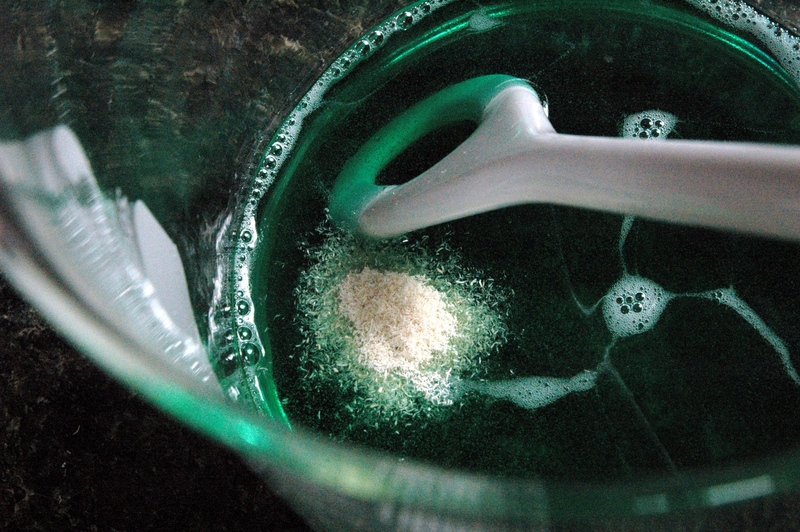 Add 1/2 teaspoon of the ground luffa and stir in to the soap. 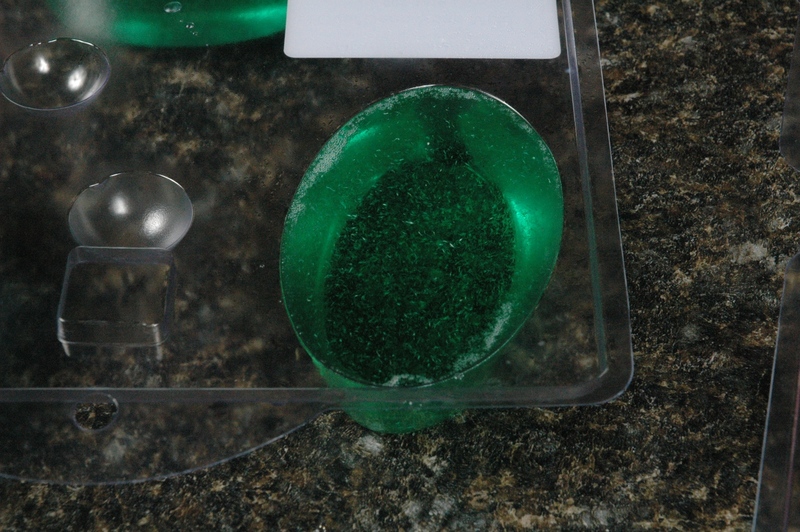 Pour into the Oval Soap Mold. 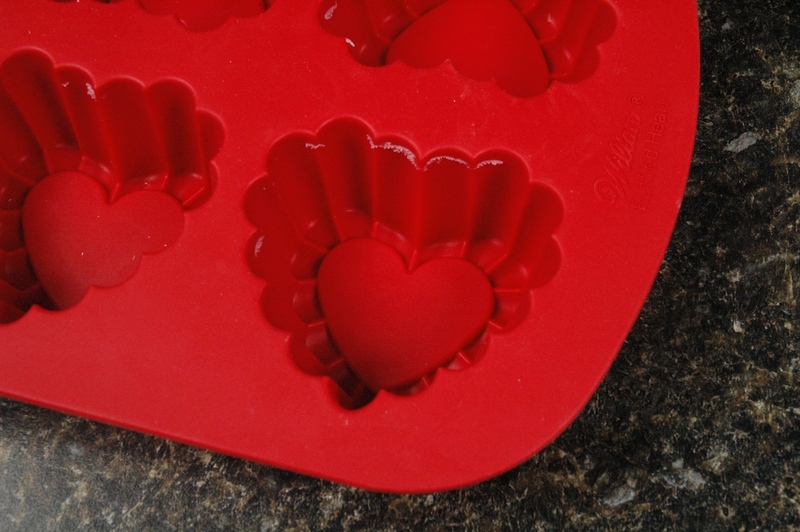 I had 1 ounce left after filling the molds, so I filled a small heart from the Bath Fizzy Hearts post on April 1st. 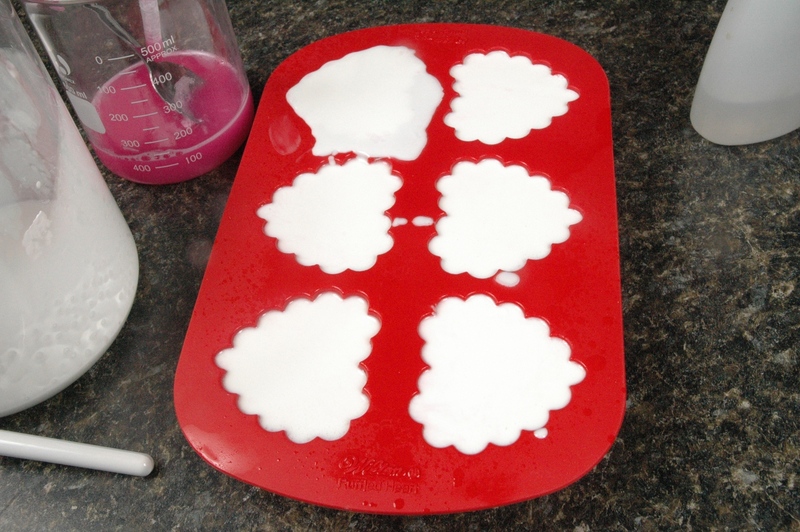 Allow the soap to cool and then pop the soap out of the molds. Tada! The soap is now ready to use. 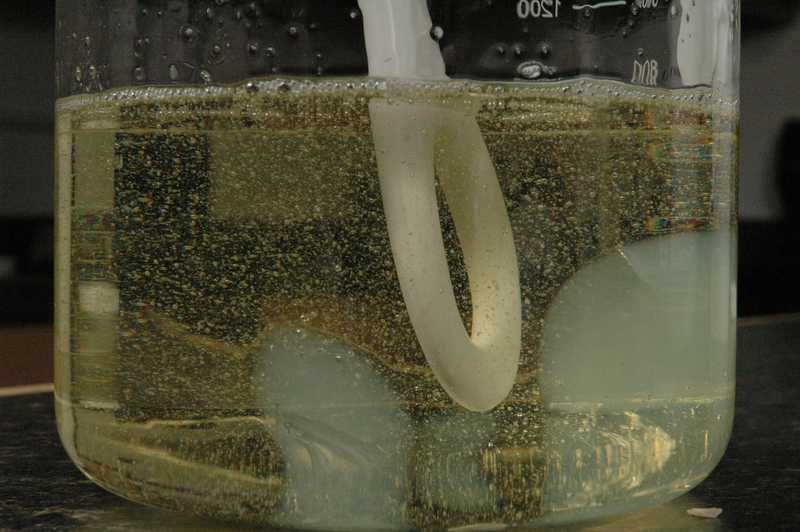 Stirring solid soap in the melted soap. 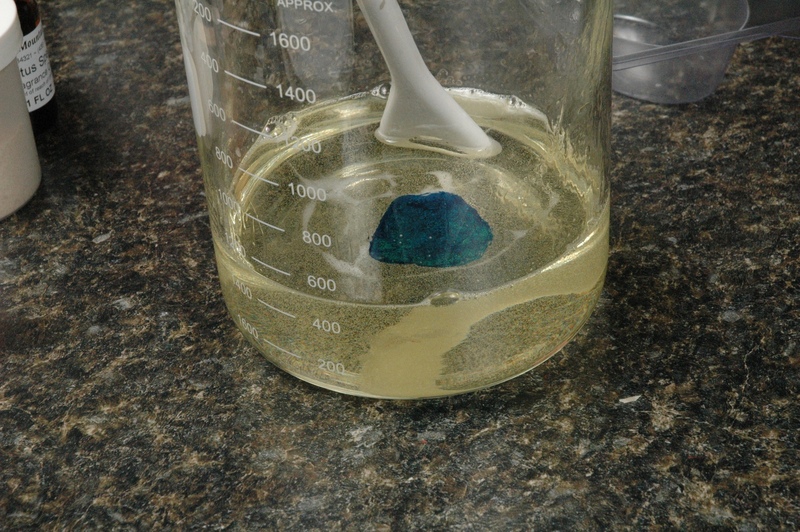 Adding blue color to soap. 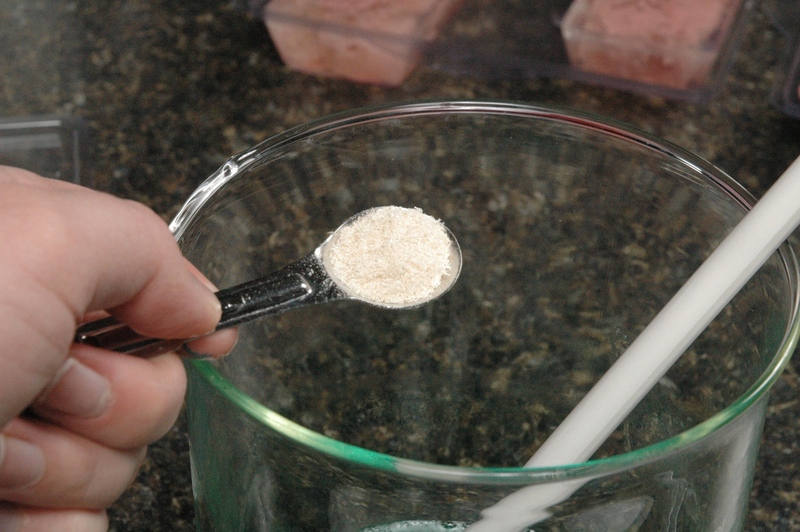 In one container, measure a small amount of Transparent Melt and Pour Soap (approximately 2 oz) with a small chunk of White Melt and Pour Soap (about the size of a grape). Melt this soap. 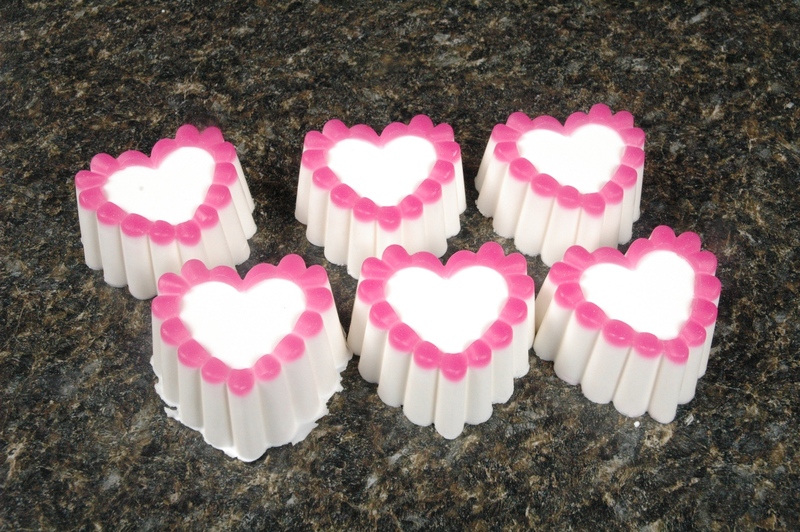 In the other container, melt White Melt and Pour Soap (approximately 15 oz). 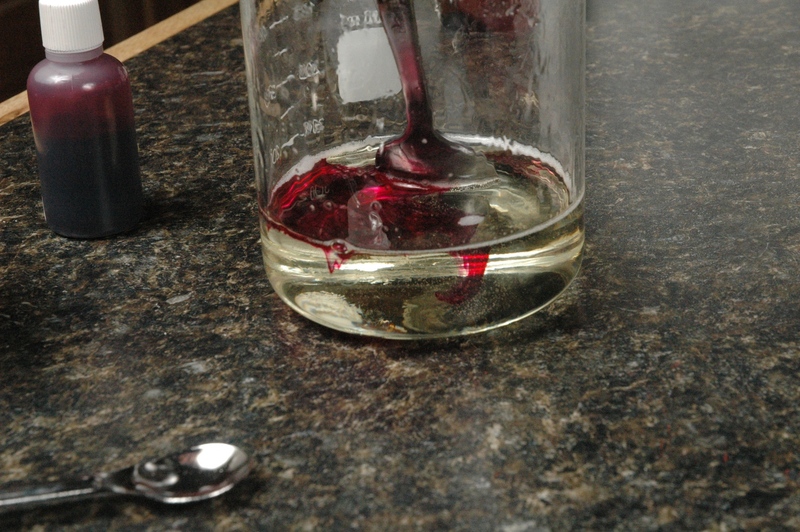 Once both containers of soap are melted add 1/2 mL of Blackberry Sage Fragrance Oil to the Transparent Melt and Pour Soap and add 4 mL of Blackberry Sage Fragrance Oil to the White Melt and Pour Soap. 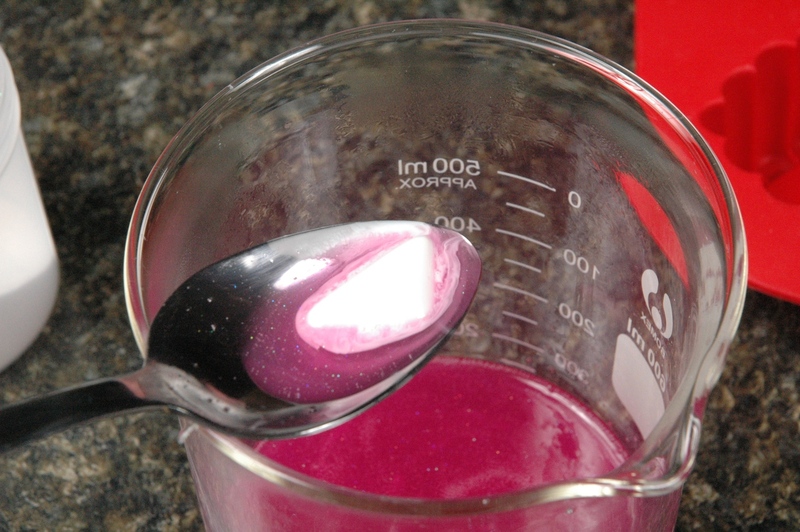 Add 3 drops of Red color and about 1/16 of a teaspoon of glitter to the Transparent Melt and Pour Soap. Once the glitter is mixed into the small amount of soap, use a transfer pipette and fill the piped ribbon section around the edge. 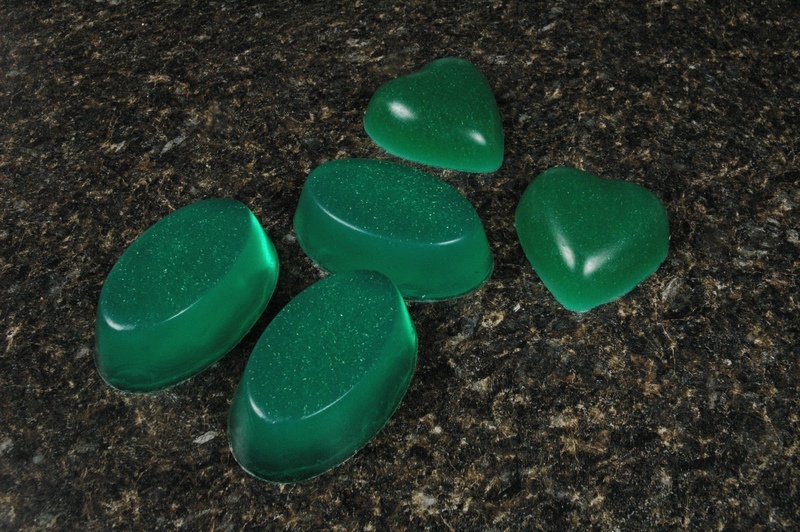 Once the soap has cooled and is solid, pour the White Melt and Pour Soap into the mold. This soap must be cool, because if it is too hot, it will melt the pink ribbon design. Allow soap to cool. Now it is ready for giving away! 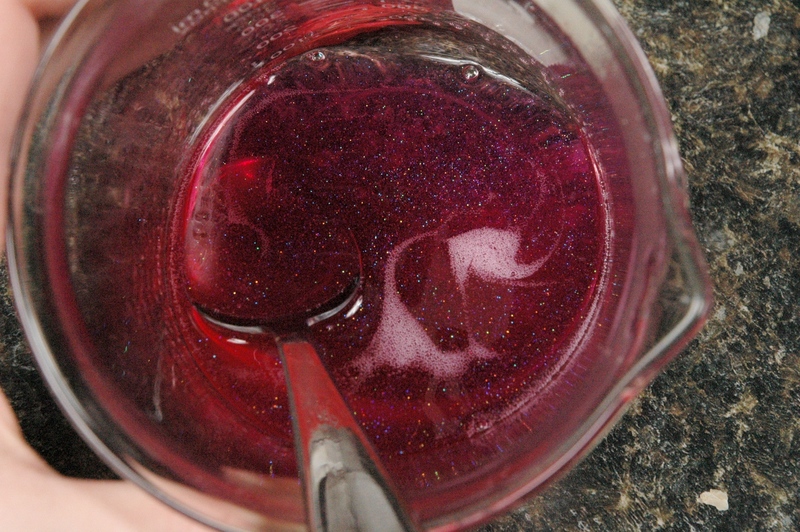 Adding red color to transparent soap. Stirring in the chunk of white soap. The chunk of soap isn't quite melted yet. Mold filled with white soap. Filling the edging with the pipette. I’ve had several people ask me how to get the soap out of the buckets we offer it in. I have a process that is 5 steps and really easy to follow. 1) Remove the lid from the bucket. 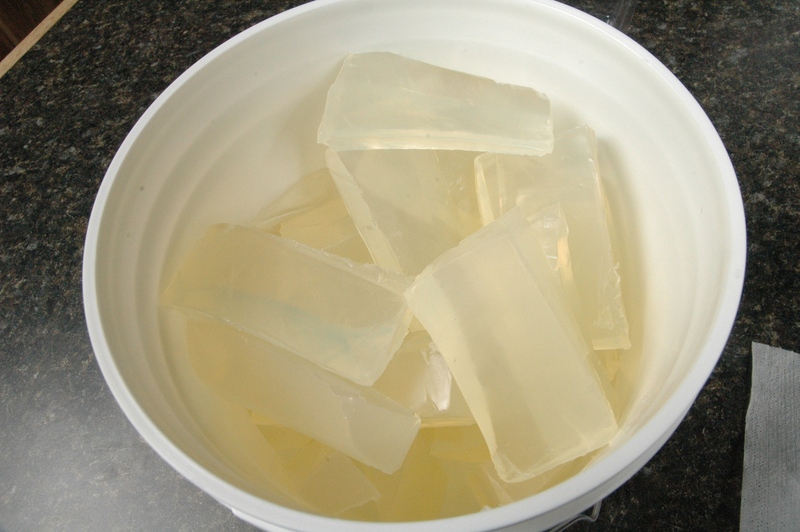 2) Hug the top of the bucket to allow air to get in down the sides of soap. 3) Replace the lid on the bucket and turn the bucket over on the floor. 4) Press on the bottom of the bucket. The soap will fall onto the lid. 5) Turn the bucket back over and remove lid again. Your soap can now be removed from the bucket and cut. After you have cut off what you need, you can then place the excess back into the bucket. 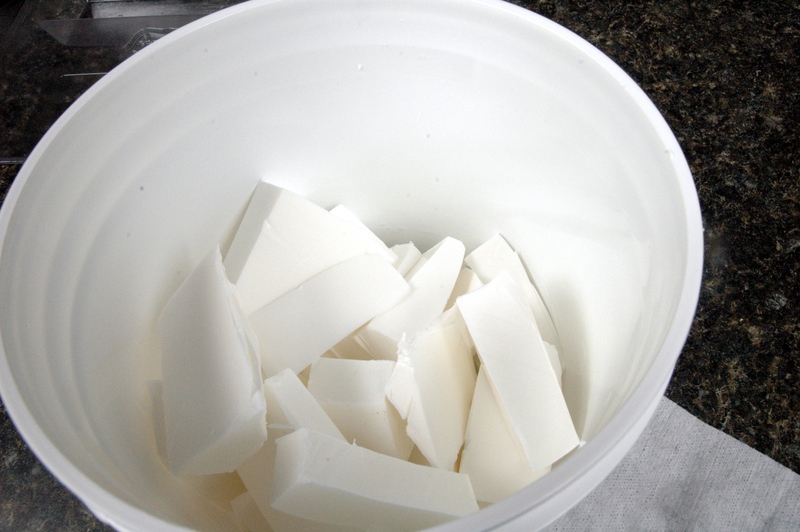 I also like to cut up all the soap and just put it back into the bucket and then I don’t have to cut it again next time I make soap. Next week is all about fun with Lotion! Head to toe moisturizing and enjoying it!